Her body was of full of bullets, but Angel — a tiny, 2-year-old Siberian Husky — still wanted affection from human hands even after one had squeezed the trigger of .22 caliber gun over and over. “I don’t think she has any memory of it, with the way she acts. She loves people,” explains Pamela Weir, who (along with her husband Warren) adopted Angel from California’s ARA Canine Rescue last September. “I first saw her on the Channel 5 news. They said she had been shot four to six times,” Weir recalls. Angel’s story was newsworthy for several reasons. She was the second Siberian Husky to be shot and then end up in the care of ARA Canine Rescue in just two weeks. The cases were unrelated, but both dogs were transferred to ARA from Riverside County Animal Services after each was found wandering and wounded. According to ARA founder Alley Ramirez, it’s sadly not uncommon for stray dogs to be shot at in rural parts of the county, but unlike the first shooting victim — a dog named Stella — Angel wasn’t hit with the typical blast of buckshot. Veterinary examinations revealed Angel had been shot by a .22 caliber gun. One shot from that type of gun would have certainly sent the sweet, 28-pound Husky to the ground. It was clear that someone had continued shooting Angel while she was down. She was fortunate to survive the attack, and even more fortunate to find herself in the care of ARA, where she would receive the surgeries she needed and the home she deserved. 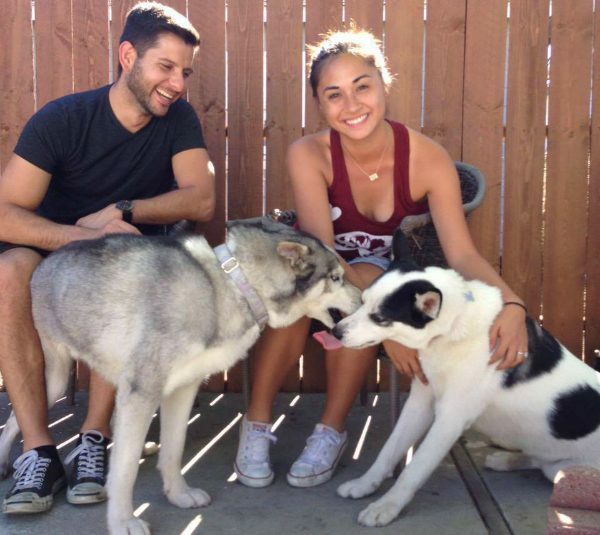 After seeing Angel’s story on the news the Weirs got in touch with ARA and applied to adopt the small Husky. 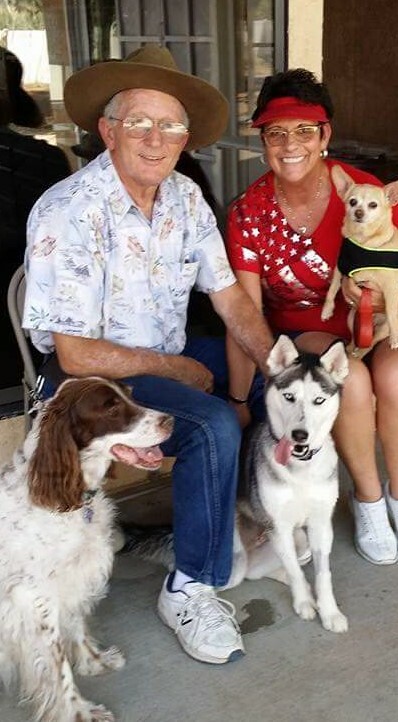 After a few emails back and forth the couple scheduled a meet and greet, bringing their Chihuahua, Chica, and Cindy, their late Llewellin Setter, to meet Angel. Watching the three dogs romp around together, it became clear to the Weirs that Angel would be coming home with them. After just one month in the care of ARA, Angel had made a miraculous recovery. It’s been just over one year since Angel came to live with her new family, and she has proven that she is no victim — she’s just the typical high-energy, highly intelligent Husky. She has even learned how to open doors. “When we’re training her or teaching her things, she picks it up right away. Two or three times, and she’s got it,” Weir says proudly. A self-described stay-at-home dog and horse mom, Weir points to Angel as an example of the resilience of rescue dogs. These days Angel spends her days playing with Chica the Chihuahua, who loves to run all over the larger dog and pull playfully on her ears and cheeks. Angel isn’t the only ARA dog with a happy ending. According to ARA board member Penelope Brown, the other shooting victim, Stella, had a longer recovery both mentally and physically, but she too was adopted into a loving home after a tail amputation and surgeries to remove dozens of gunshot pellets from her backend. Stella has been with her new family for about 11 months now, and has developed a close bond with a Husky sibling who has been able to lend her some confidence. Stella’s family reports that she is a normal, playful and energetic Husky now, just like Angel. In each case, it took one human hand to pull the trigger, but so many more to help the dogs heal. Thanks to gentle petting from the volunteers at ARA, veterinarians, and eventually, families of their very own, Angel and Stella now know what human hands are really for. The post Angel the Siberian Husky Survives Shooting, Thrives With New Family appeared first on Dogster.